New, bigger&better scans of the stories from the same issue (with HAG fc added), uploaded many years ago. Comic Story (11 pages) Terror At Kaliko! Synopsis: El Hammad impersonates the deceased M'zabi and orders M'zabis men to kill Ann and Zulu. 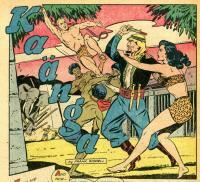 Kaänga frees his companions and exposes El Hammad as an imposter. Synopsis: Posing as ivory traders, Carver and Strang attempt to persuade Kaänga to protect them from a pursuing tribe. 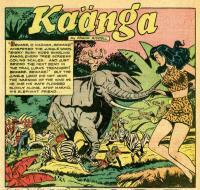 Kaänga soon discovers that the ivory traders have stolen the tribe's sacred treasure. He captures the two traders and restores the treasure to the tribe. 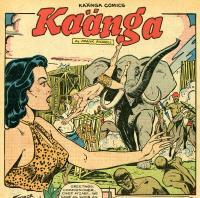 Synopsis: Kaänga and Zulu rescue Ann and a hunting safari from the slaver, Sheikh Chandar.